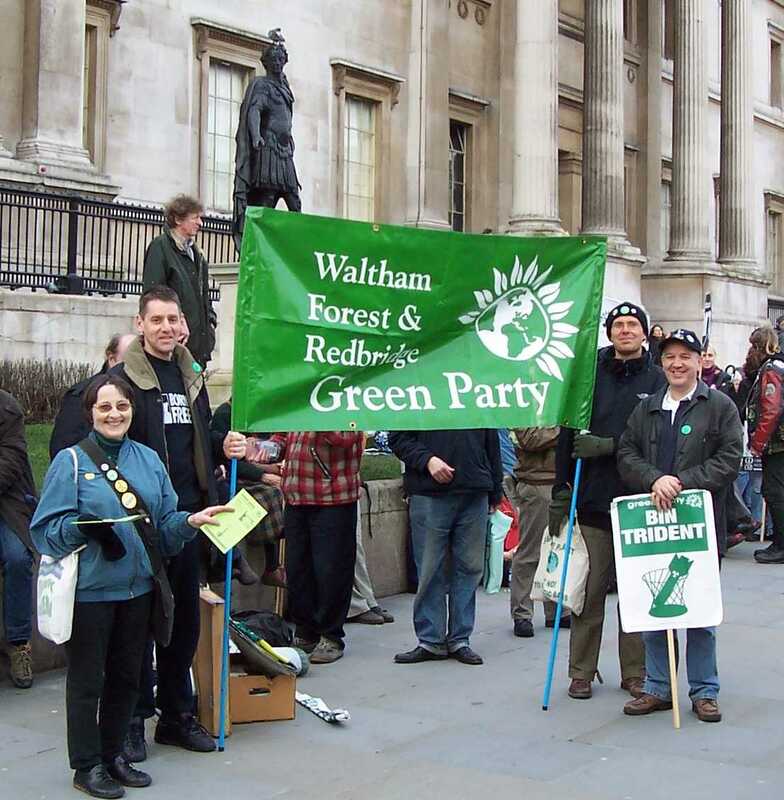 Waltham Forest Green Party supports the overall aim of the plan to develop a unique and vibrant suburban centre with daily needs being met within the town centre an example of sustainable living. Unfortunately, some of the details contradict this aim, such as - ‘removing the reliance on cars’ but also ‘streets accommodating pedestrians and vehicles’ (The Vision and core principles) and ‘a high quality environment for pedestrians, cyclists, buses AND CARS’ (my emphasis). If we are to create a civilised environment for the 21st century, we must tame the car and give preference to sustainable methods of transport - walking, cycling and public transport. The council is being far too timid - we should be removing the constant threat from traffic and allowing people to circulate easily around the town centre on foot or bicycle. ‘Daily needs are within walking distance of most residents’ (The Vision) but also ‘the town centre faces a number of key challenges: the nearby 2012 Olympic Games, - retail competition from ever expanding sub regional shopping areas and rising property prices’ (Princes Foundation Vision Statement). If we are really concerned about an environmentally sustainable town centre, these challenges are irrelevant. Walthamstow doesn’t compete with Stratford, Ilford or Wood Green - it’s a different sort of place, one which is much better placed to meet the real challenges of a world with scarce resources. ‘New innovatively-designed mixed-use developments will be sympathetically integrated into the historic heart of the town centre’ (The Vision) but we have also had the prospect of an 18-storey block on the Arcade site! The Green Party believes this site should have a maximum of 6 storeys as proposed in previous plans. There are some aspects of the town centre proposals that we support such as making the market more user-friendly and providing workshop units for artists priced out of other areas; these suggestions fit well with the aim of a sustainable, human-scale town centre but many of the other ideas do not. The council needs to decide exactly what it wants and then explain this fully to local residents. Members of Waltham Forest and Redbridge Green Party joined the candlelit procession in Central London to mark International Animal Rights Day. The march followed a rally in Holborn that was addressed by Green Principal Speaker Derek Wall and had messages of support from animal rights activists around the world broadcast on a giant TV screen. The march went past the Houses of Parliament with the giant TV screen showing a positive animal rights presentation bringing up the rear of the procession. 2007 was the 10th International Animal Rights Day - a day when the animals killed and tortured in animal experiments, factory farming, bloodsports and other forms of animal exploitation and cruelty are remembered. Animals, and the compassionate people who try to defend them, have always faced an uphill struggle when campaigning for political progress. The institutions that make decisions affecting the vital interests of millions of animals have in-built bias in favour of those who exploit and abuse animals. The animal experimentation industry dominates the Home Office, while DEFRA - which covers animals on farms - has traditionally had very close relations with meat and dairy interests. "It is time that the suffering and exploitation of animals was stopped and such cruel practices as vivisection, factory farming and hunting were banned"" said Mark Dawes of Waltham Forest and Redbridge Green Party "Animals deserve to be treated with respect not as resource to be exploited" he added. From left to right, Mark Dawes, Jean Lambert MEP and Chris Olende. Members of Waltham Forest and Redbridge Green Party marched from Westminster to the American Embassy in Grosvenor Square to call for action on climate change. The march coincided with the climate change talks happening in Bali. The rally in Grosvenor Square had speeches by speakers including Green MEP Caroline Lucas and the writer George Monbiot. The event was organised by the Campaign Against Climate Change and was supported by the Green Party; it was attended by thousands of people. There is now a scientific consensus that climate change is happening and it is the result of human activities such as the burning of fossil fuels and the farming of animals for meat and dairy products. If the temperature rises more than 2% over pre-industrial levels, the effects will be catastrophic. In the UK, there will be more flooding and an increase in extreme weather conditions whilst globally, countries will be flooded and there will be an increase of people dying of starvation because less land will be suitable for agriculture. "Action is needed by Governments now if climate change is to be averted" said Mark Dawes of Waltham Forest and Redbridge Green Party "We must pressure our Government to take climate change seriously and stop it's policy of airport expansion and road building. On an individual level, the most effective step to take is to reduce consumption of meat and dairy products as the meat and dairy industry is one of the biggest contributors of greenhouse gas emissions" he added. Waltham Forest and Redbridge Green Party Co-Ordinator Mark Dawes joined hundreds of protesters on the anti-fur march and rally in Central London on Saturday December 1st. The protesters, who came from around the country, took the anti-fur message right to the heart of the UK's fur retail trade. After a rally with speeches in Belgrave Square, the march wound its way along Sloane St and Brompton Rd, past some of the most notorious retailers and designers of fur, including Gucci, Prada, Escada, Versace, Fendi, Joseph, Armani and Burberry. Outside Harrods, who sell fur from foxes, raccoons, wolfs, chinchillas, squirrels, rabbits, beavers and coyotes, the march stopped and a minute's silence was observed in memory of the many thousands of fur bearing animals who will die for fashion this year because of Harrods' pro fur policy. The Government, to its credit, banned fur farming in this country but it still allows fur to be sold in shops. This keeps in business the cruel and barbaric fur farms overseas. As well as for coats, fur is used for trimmings on coats and gloves, sometimes without the buyer knowing it is real fur. "The fur trade is a barbaric and cruel industry and should be stopped" said Mark Dawes, Co-Ordinator of Waltham Forest and Redbridge Green Party, "I would urge people not to buy fur and to boycott all shops that sell fur including Harrods" he added. Local campaigner Ashley Gunstock, has been chosen as the Green Party's candidate to contest the Havering and Redbridge constituency in next year's GLA elections. 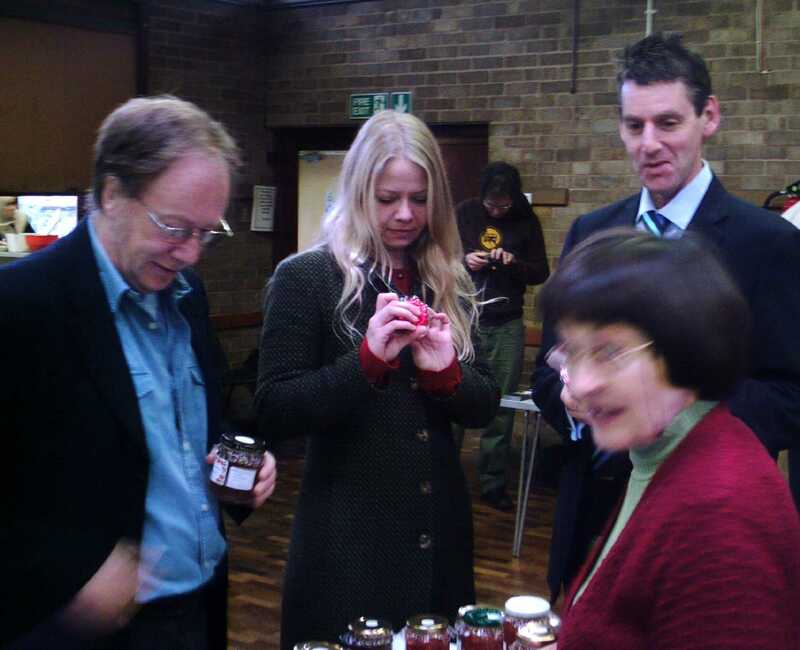 Ashley recently launched his campaign while hosting Green candidate for Mayor of London, Siân Berry, at a Green Party Bazaar in St Mary with Christ Church on the Green in Wanstead. Commenting on his selection, Ashley said: "I'm honoured to be selected to fight Havering and Redbridge for the Green Party. As we see more and more corporate takeover and environmental damage, a local Green voice has never been more urgent. "If I'm elected next May, I'll be working to make Havering and Redbridge a Greener, more affordable place to live and work. I'd like to see Wanstead, Snaresbrook Redbridge tube stations re-designated into Zone 3 to make travel cheaper; I'll be campaigning on behalf of local business, like the cafes in Wanstead under threat from yet another coffee chain proposal; and putting more pressure on developers to provide the high-quality affordable housing that the area, like all of London, desperately needs." Siân Berry, Green candidate for Mayor, added: "Ashley would be a brilliant Assembly Member. Long before he even thought of running, he's been doing a great job campaigning locally for a better deal for Havering and Redbridge. If I'm elected Mayor, I'll be helping him out with his campaigns by making all new large business developments set aside half of their floor space at affordable rents for local business, and increasing the requirement on developers to build affordable homes to 60 per cent of properties in new developments." The Green Party Bazaar has helped raise money for Ashley's campaign for a Greener Havering and Redbridge. November 1st is World Vegan Day and will be celebrated with events all over the world. A vegan does not eat any animal products at all including dairy and eggs. Whilst most people know the ethical reasons for being a vegan, as it reduces cruelty to animals, there are very good environmental reasons too. According to a UN report released last year, 18% of the global greenhouse gas emissions that are the cause of climate change come from the meat and dairy industry, that compares with a total of 16% from transport. One of the biggest steps people can take to reduce their personal greenhouse gas emissions and help save the planet, is to go vegan or vegetarian, or at the very least eat less meat and dairy. The Greens are urging Waltham Forest Council to stop investing in companies that have ties to Burma. The recent protests in Burma bought to the world's attention the horrific situation in Burma. The following crackdown by the military junta saw peaceful protesters included monks murdered, imprisoned and tortured. In response to calls from Burma's democracy movement, the Burma Campaign UK and other campaign groups around the world have been pressuring companies to sever business ties with Burma. Burma's democracy leader, Aung San Suu Kyi has called for a boycott of all foreign investment in the country and business with the military regime as the quickest way of bringing it down. However, Waltham Forest Council has been investing in companies that are "supporting" the military regime in Burma. As it is our council tax that is being invested, it is local residents that are being forced to invest in Burma. The Burma Campaign UK has produced a "dirty" list of companies that have ties in Burma and are therefore providing financial and moral support for the brutal military regime that has ruled Burma for more then four decades. The regime has been implicit in destroying the Burmese people's struggle for freedom, dignity, justice, equality, peace, democracy and human rights. Waltham Forest Council, in the last quarter, had investments in Chevron, CNOOC, Total Oil and Maersk. "The feedback from the council has been positive on this issue and I am hoping this will lead to the Council ceasing investment in companies with ties to Burma and having a firm policy to support the people of Burma by not investing in these companies in the future " said Mark Dawes of Waltham Forest and Redbridge Green Party. Waltham Forest and Redbridge Green Party supported the Climate Camp at Heathrow this week and local Green member Susanne Marshall visited the Heathrow Camp for Climate Action too. The Camp is on the proposed site of a third runway for Heathrow: its construction would involve demolishing housing in two villages and re-housing about 1000 people. The week long camp was established with its own water supply, electricity from wind turbines and solar panels, several kitchens, a children's play area and a variety of site offices and meeting spaces in marquees and achieved its main objective to highlight the aviation industries contribution to climate change. News media from five continents covered the Camp, emphasizing the link between aviation and climate change as never before. Attempts to smear these efforts by some elements in the media were rebutted. "The Government spends about £9 billion a year subsidizing air travel and is committed to airport expansion despite noise and pollution. Aviation is the fastest growing source of greenhouse gas emissions and the Governments plans to expand the aviation industry could be catastrophic for the environment" commented Mark Dawes of Waltham Forest and Redbridge Green Party. Whilst the cruelty of bullfighting may seem far removed from the UK taking place in countries such as Spain, bullfighting actually relies on tourists from the UK to stay in business. The majority of Spaniards oppose bullfighting and indeed cities such as Barcelona have passed resolutions to ban it so bullfights increasingly rely on tourists thinking they are seeing part of a "tradition". But, like the cruelty of fox hunting that also masqueraded as a "tradition" here, animal cruelty and suffering should never be thought of in those terms. Bullfighting is very cruel as bulls are repeatedly stabbed with knives and swords until they die. "I urge people going on holidays in countries where there is bullfighting not go to see them, as that would be supporting the barbarity. If all tourists stopped attending bullfights, they would go out of business and this animal cruelty would stop" said Waltham Forest and Redbridge Green Party spokesman Mark Dawes. 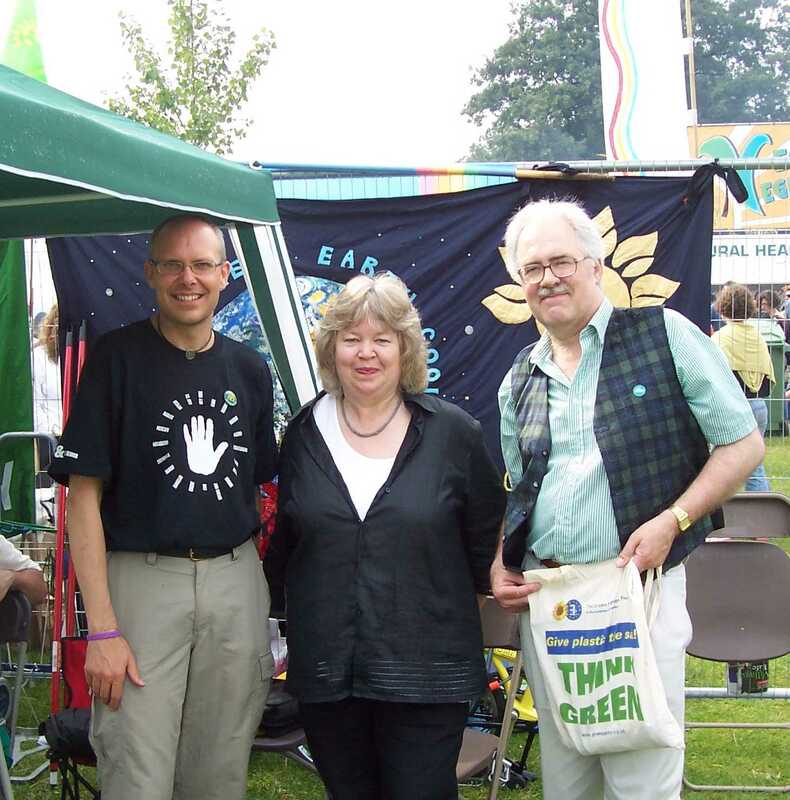 Members of Waltham Forest and Redbridge Green Party, including MEP Jean Lambert, attended the RISE festival at Finsbury Park; an event attended by thousands of people. RISE:London United Against Racism promotes anti-racism and celebrates cultural diversity. "It was great to see so many people at a festival that opposes racism and celebrates the cultural diversity of modern London" said Waltham Forest and Redbridge Green spokesman Mark Dawes. The recent flooding in the UK was not only probably caused by climate change but also showed how climate change will affect us in the future. Climate change will lead to more flooding in an increasing number of places in the UK. Whilst climate change needs to be tackled by the Government in actions rather than just words, there are steps that can be taken locally. Unfortunately there has been an increase in patio heaters outside pubs and cafes recently. Patio heaters are an extraordinary waste of energy as well as generating greenhouse gases (the cause of climate change); each patio heater generates 2.2 tonnes of carbon dioxide on average per year - the equivalent to driving a car for over 6,000 miles! "For the sake of the climate, I would urge pub and café owners not to install patio heaters, it is the kind of change we are going to have to make to save the planet" said Waltham Forest and Redbridge Green Party spokesman Mark Dawes. The so called Great British Circus is currently holding a circus in Fairlop Waters. The circus, unlike the majority of circuses, still (ab)use wild animals as part of their "entertainment". It is disgraceful that wild animals such as lions and tigers are degraded by being circus exhibits and are carted around the country in such an undignified way. This is an outdated form of "entertainment" and surely there is no place for it in a civilised society. The Great British Circus used to hold a circus on Chingford Plain and there were a number of letters in the local paper concerned about the treatment of the wild animals. After a campaign, including a boycott of the circus by people concerned with the welfare of animals, the circus was replaced by one that does not use wild animals. We urge everyone to boycott the Great British Circus until such time as they do not use wild animals. As was shown on Chingford Plain, this can be successful in achieving a victory for animal welfare. The Borough of Waltham Forest achieved Fair Trade status after years of campaigning by local activists. There was a special event held on World Fair Trade Day - Saturday 12th May to celebrate this achievement. Speakers included Green MEP Jean Lambert as well as local MP Harry Cohen and the Leader of the Council. To become a Fair Trade Borough five goals have to be met including the local council passing a resolution supporting Fair Trade and a range of Fair Trade products being available and used in a number of local work places. 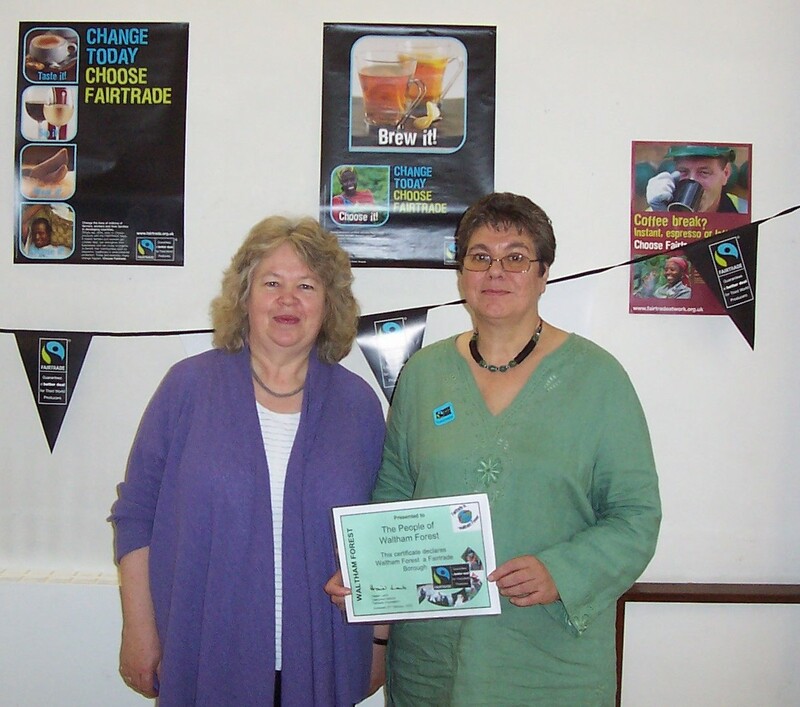 Jean Lambert said: "Being awarded Fair Trade status is an achievement. Everyone throughout the Borough should be proud that they have made these changes and that the council has responded to local campaigners. "Some of the World's developing countries face falling prices and a continuing battle to get a fair price for their goods and acceptable working conditions. Consumers of products carrying the fair trade logo can be sure that human rights have been observed throughout production and that producers have a chance to gradually to develop their own independence and communities. "I now hope that other London Boroughs will follow Waltham Forests' excellent example and make their way to becoming Fair Trade Boroughs." April 24th is World Lab Animal Day, a day that is recognised by the United Nations and is marked by anti-vivisectionists on every continent. The day highlights the suffering of animals (including primates) being experimented on for so-called medical purposes. In fact, vivisection has been shown to be unreliable and unnecessary and now medical research can be carried out that does not involve torturing animals. Animals are not only subject to cruel experimentation for dubious medical reasons but are also used to test the effects of illegal, recreational drugs such as cannabis and by the Ministry of Defence to test the effects of modern weaponry. Animals are also still used to test the cosmetics. This cruelty has been banned in the UK but some unethical companies have outsourced the testing of new ingredients to countries where this cruel practice is still legal. And unfortunately the phrase 'this product was not tested on animals' is no guarantee as it merely means the finished product has not been tested on animals but offers no guarantee individual ingredients have not. To ensure that the products you buy have not been tested on animals, you can check on the website www.buav.org/gocrueltyfree/ukcompanies.html. The Greens oppose the use of hawk to clear pigeons, this follows news that Walthamstow Bus Station have "employed" a hawk to move pigeons away from the bus station. It is cruel and unnecessary. There are humane methods of moving pigeons away from areas where there is a problem including netting that is also being employed at the bus station. Experience has shown that hawks are an ineffective way to remove pigeons. Using a hawk is more of a gimmick than a serious way of dealing with the problem and a cruel one at that. Green MEP Jean Lambert spoke at a rally in Central London to support the Sustainable Communities Bill currently going through Parliament. Other speakers included Conservative leader David Cameron and Liberal Democrat leader Menzies Campbell. The Sustainable Communities Bill, if made law, will empower local people to make their own decisions and drive government policies on sustainable communities. Central government will have a duty to reverse "Ghost Town Britain" - the ongoing decline of local economies and local services and facilities and the knock-on social and environmental impacts. The Bill also sets up a mechanism so that the actions of government are not decided centrally in London, but rather by local communities themselves. Greens from Waltham Forest and Redbridge joined up to 100,000 people marching through Central London to Trafalgar Square to show their opposition to replacing our Trident nuclear deterrent. The rally in Trafalgar Square included a number of speakers from a wide range of backgrounds including Green MEP Caroline Lucas. The government is about to spend as much as £75bn on replacing our so-called nuclear deterrent. The latest Trident costs, based on information extracted in parliamentary answers, suggest an overall figure of £76bn to buy missiles, replace nuclear submarines, and maintain the system for 30 years. The Greens believe this money could be much better spent on public services like health and education or to tackle climate change, the most pressing problem in the world today. The UK will be in breach of the non-proliferation treaty if the Government renews our nuclear deterrent. At a time when the UK Government has condemned North Korea and Iran for attempting to gain nuclear weapons, it is hypocritical in the extreme for it to be acquiring new nuclear weapons. "Britain should get rid of its nuclear weapons and should certainly not be replacing them" said Mark Dawes of Waltham Forest and Redbridge Green Party, "There is no need for the UK to have a nuclear deterrent, the cold war is over and a nuclear deterrent will be no use against a terrorist threat" he added. Despite the initial reports that the recent outbreak of Avian Flu in Suffolk was caused by wild birds, it now seems to be the case that the disease came from factory farms in Hungary. This should come as no surprise; within factory farms, birds are kept in very crowded conditions, fed unnatural diets and exposed to unimaginable stress; this creates a breeding ground for illness, infections and eventually epidemics such as Avian Flu. Whilst the blame has often being put on migrating wild birds, the spread of Avian Flu seems to follow the rail and road routes of factory farmed produce rather than the routes of migratory wild birds, the disease originating from the massive factory farms in Asia. In order to stop these outbreaks, animals must be kept in good conditions and not factory farmed in an inhumane and cruel way as happens now where the profits of agribusiness are given priority over the decent treatment of animals. For the sake of our health as well as animal welfare, factory farming needs to be ended. In the meantime, people can avoid factory farmed products by buying free-range, organic meat or meat-free vegetarian alternatives. 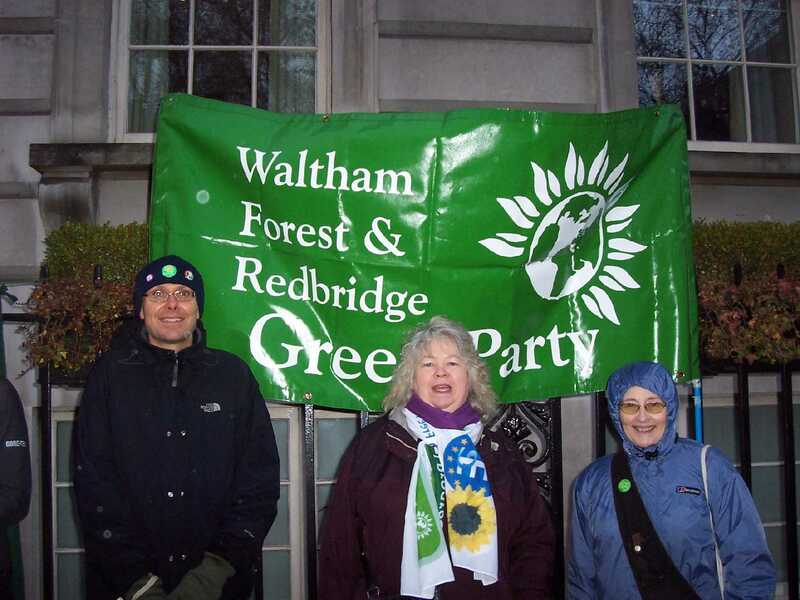 Waltham Forest and Redbridge Green Party members joined over a thousand people to march to save Whipps Cross Hospital. Whipps Cross Hospital is in danger of being downgraded or even closed but an overwhelming number of local people want the hospital kept as a fully functioning, fully funded District General Hospital. The cause has cross party support with both Labour and Conservative local MPs addressing the rally and members of the Liberal Democrats, Respect, Socialist Party as well as Green Party being present. "The Green Party supports the campaign to save Whipps Cross Hospital" said Waltham Forest and Redbridge Green Party spokesman Mark Dawes, "but also we want to see the end to the privatisation of the Health Service with the focus being on people's health rather than the profits of Big Business" he added. Two local politicians joined forces last week to protest against the Government's plans to renew the Trident nuclear deterrent. 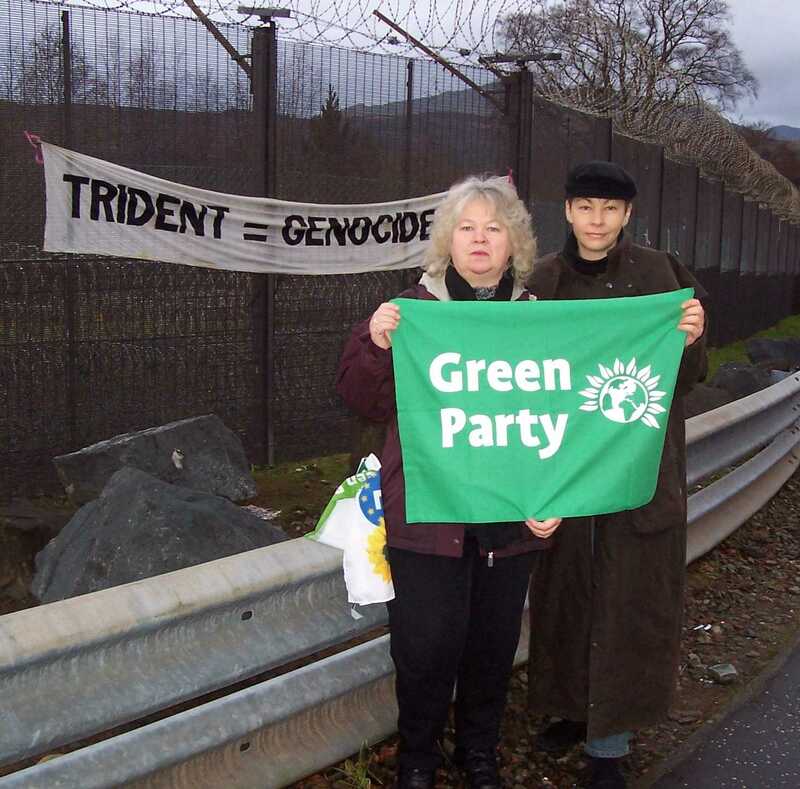 Jean Lambert, Green MEP for London who lives in Walthamstow, and Harry Cohen, MP for Leyton & Wanstead, met up at the Faslane submarine base in Scotland on a day designated for elected representatives to join the blockade there. "It was worth standing around for hours in the rain and risking arrest to draw attention to the Government's plans to spend many billions of pounds on weapons that will not be used and will not contribute to a safer future for the world", said Jean. "Renewing Trident would be a complete waste of money, said Harry, "and makes it more difficult for Britain to persuade other countries to give up their weapons or to not develop them at all." Local campaigners against the proposed Tescos superstore in Highams Park were heartened by a visit from Jenny Jones, a Green member of the Greater London Assembly, who is also Chair of the London Food Commission which has produced the Sustainable Food Strategy for London. Jenny looked around the local shops in Highams Park and inspected the site where the Tescos store is planned. 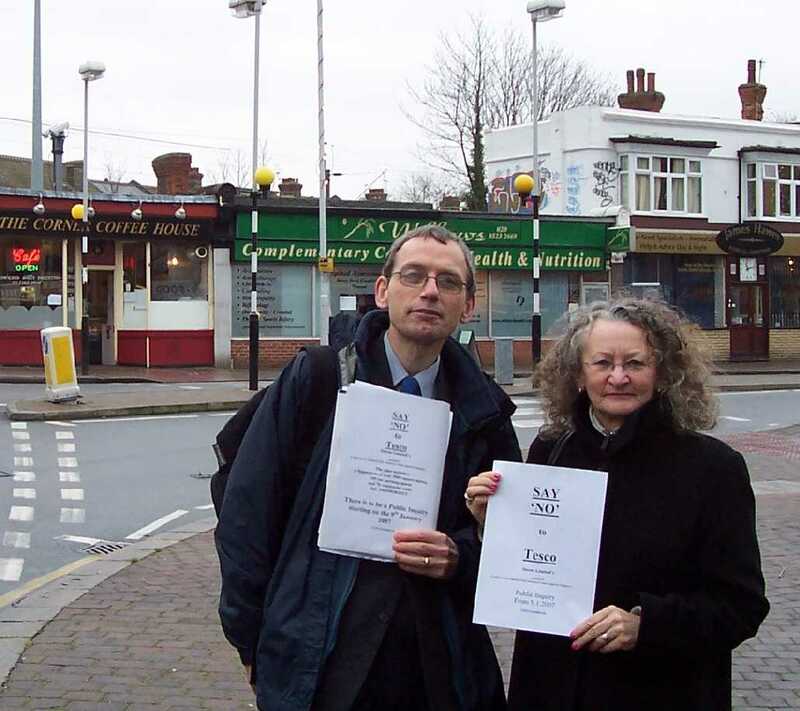 She then expressed her support for campaigners who say that Highams Park is not an appropriate place for such a development as it will damage the existing local shops. The Public Inquiry on the proposed Tescos store opens on Tuesday 9th Jan.
"This large development is clearly unsuitable for the area and goes against many objectives of London's Food Strategy such as reducing the negative environmental impacts of London's food system", she said. "I shall be raising this with the Mayor, Ken Livingstone, and I shall also be writing to Tescos to draw their attention to how their plan conflicts with London's Food Strategy." 10th December 2006 was the 9th International Animal Rights Day - a day when animal advocates around the world held candlelit vigils at establishments involved in animal experiments, factory farming, bloodsports and other forms of animal exploitation and cruelty. Protesters lit candles to remember animals that have suffered abuse at the hands of humans. The aim of International Animal Rights Day is to call for animals to be afforded basic rights not to be abused and exploited for human 'benefit' and to call for the basic rights of animals to be recognised in accordance with the Universal Declaration of Animal Rights. Awareness will be raised of the abuse animals receive in such cruel practices as vivisection, factory farming and hunting. The Green Party will continue to work to stop animal cruelty and abuse. 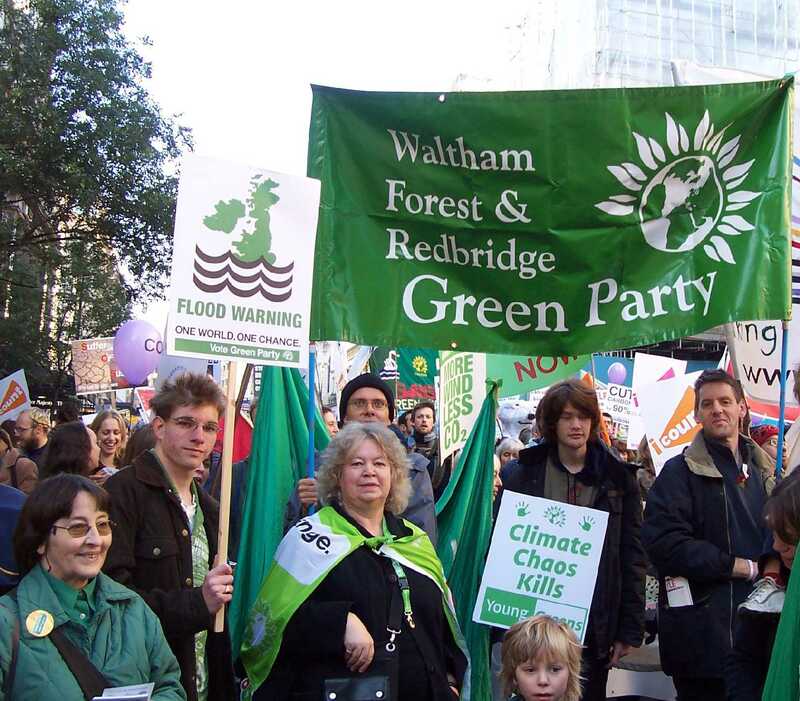 Members of Waltham Forest and Redbridge Green Party marched through the centre of London to Trafalgar Square to protest against climate change and to urge the Government to act. The rally saw speeches by speakers including Green MEP Caroline Lucas and the writer George Monbiot. 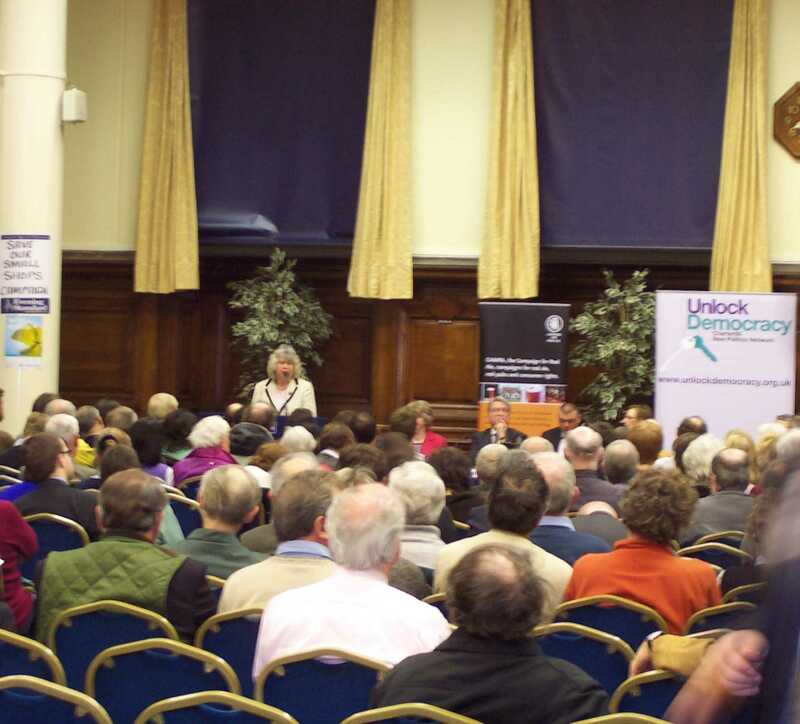 The event was organised by the Campaign Against Climate Change and ICount and was supported by the Green Party, it was attended by over 25,000 of people. Climate Change threatens the very future of human civilisation as we know it and failure to act to will cost thousands if not millions of lives. The last ten years have seen a dramatic increase in the world's temperature and scientists working in the field of climate change believe this is due to the effects of human activity. In fact, scientists are now predicting that the temperature rise will be far more than previously thought. The effects in the UK will be devastating with more flooding and an increase in extreme weather conditions. The effects globally will be even worse as countries are flooded and there is increased starvation due to less land being suitable for agriculture. The Stern Report, published last week, made it clear that we need urgent global action if we are to prevent the worst impacts of devastating climate change and even the UK government's chief scientist Sir David King has said that climate change is a bigger threat than terrorism. "Whilst I am pleased that the other parties are acknowledging climate change, they are still advocating the same economic policies that caused the problem in the first place" said Mark Dawes of Waltham Forest and Redbridge Green Party. "Despite Blair's words, this Government continues to support a massive road-building programme and the biggest expansion of the aviation industry - the fastest growing contributor to greenhouse gas emissions - for a generation" he added.